What are the top 10 best Disney Hollywood Studios attractions? Disney Hollywood Studios has something for all ages to enjoy. From thrilling rides, to nostalgic journeys through movie history, to Broadway quality stage shows you are sure to have a great day in this Disney theme park. Here is my own guide to the not to be missed Hollywood Studios attractions. As you approach Hollywood Studios you see a very tall, very imposing building. This huge, almost creepy looking structure is The Tower of Terror. Being Disney you are not going to be completely terrified by this ride but you will get pretty close! Disney knows how to theme a ride and Tower of Terror is a brilliant example of how a simple idea for a ride can be taken to the heights of imagination by the Disney Imagineers. The ride will drop you 13 stories in an elevator. And then you go back up again for more. This is not for the feint of heart (or for those under 40″). 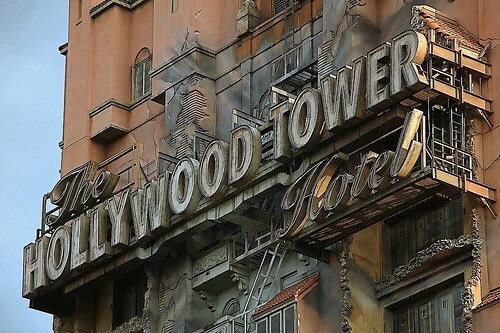 But for those who like an adrenaline rush you will certainly get that on Tower of Terror. Make sure that you take some time to look at the attention to detail of all the props and decoration in both the ride and the line. This hotel looks as though it really was abandoned in 1939! 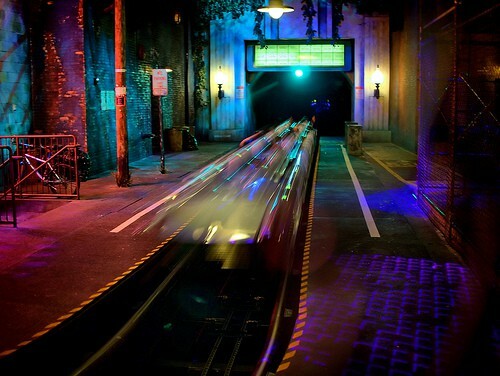 Disney goes rock n roll with this extremely fast roller coaster. The inspiration for this ride is the rock band Aerosmith. At first look that may seem to be an unlikely partnership but the result is probably the best and most thrilling of all the Disney roller coasters. Aerosmith’s Rock N Roller Coaster ride accelerates from 0-57 mph in just 2.8 seconds cataputing riders 200 feet. Riders experience G Force of up to 4.5. This is a roller coaster in the dark but it is very unlike Space Mountain the original Disney coaster. It is incredibly smooth and seems incredibly fast. The addition of speakers on each seat blasting out Aerosmith music also adds a lot to the experience. This is a roller coaster for those who may think they don’t like roller coasters. Try it even if you don’t usually like thrill rides and you may find that you are lining up for a second time.. I have seen this excellent stage show so many times that I not only know the words but most of the dance moves too – but every time I see it is a delight. The excellent cast perform music from the Beauty and the Beast stage show with music Alan Menken and lyrics by Howard Ashman. The story is of course taken from the Disney Beauty and the Beast movie. You will recognize the songs from the movie. The character of Gaston is particularly entertaining! The show usually plays 3 or 4 times a day. Check your schedule for show times. Arrive early for the best seats. Personally I like to go close to the front rows but most would prefer a view from at least 8 to 10 rows back from the stage. The theater holds up to 1500 and it does get full at busy times. It is covered so does provide some welcome shade from the Florida sun. You don’t have to be a Star Wars fan to love this ride but it helps. 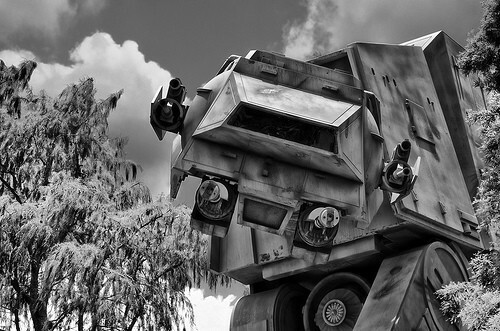 Star Tours has just undergone a very radical update making it one of the very best attractions in the whole of Walt Disney World not just Hollywood Studios. This is a classic flight simulator ride. Guests board a Star Speeder 1000 on their intergalactic journey where they will encounter creatures and characters from the Star Wars movies. This attraction now has a twist. You never know quite which direction you are going to take as there are a possible 54 variations of the Star Tours ride. Guests do have to be over 40″ tall. The Voyage of the Little Mermaid is aimed at the younger set but all ages will enjoy this combination live action, animation and puppetry extravaganza. Based upon the Disney movie The Little Movie it mixes live and recorded music with songs from the original film. Guests are seated in a large theater for the 17 minute show. Be aware that the theater is pretty dark and some of the sequences involving Ursula are also rather scary so sensitive younger children may not enjoy this as much as you may imagine. Just use your discretion and sit near the left hand side of the stage so that you can leave easily if junior gets upset. Most of the show is very upbeat though, and can have some excellent live singing performances. Want to know which is the most popular Disney Hollywood Studios attraction? This is it. Prepare for long lines and you won’t be disappointed. Toy Story Midway Mania is of course based on the very popular series of Disney Pixar movies. Our friends Buzz Lightyear, Woody, Mr Potato Head and many more are here to make sure that we have a lot of fun playing a fast moving carnival game. Guests board 4 person vehicles and don 3D glasses and head out on a series of carnival type virtual shooting games. This one really is a lot of fun but the wait definitely is not. There is a Fast Pass available but these usually run out around lunchtime (and before at busy times). Expect wait times of 70 to 90 minutes unless you get there at opening time. This fast moving stunt show is based upon the very popular Indiana Jones movies. It is a 35 minute live stunt show which is housed in a large amphitheater which holds up to 2,000 guests. It does get full at busy times and there is a Fast Pass available. The Indiana Jones stunt show is split into 3 scenes with spectacular stunts, pyrotechnics and some impressive explosions. This is something for all ages. Even if the kids don’t know the Indiana Jones movies they will still find this fast paced show entertaining. This is probably one for the grown ups but the children will enjoy the models and vintage Disney toys. For me this is one of the really essential places to visit when you go to Disney World because it puts it all into context. Walt Disney famously said “It was all started by a mouse’, but of course it was all really started by Walt and Roy Disney. Mickey Mouse may have been his starting point but it was the vision of Walt and the financial acumen of Roy Disney which made Walt Disney World possible. 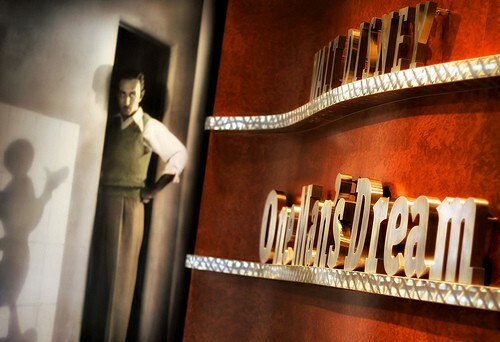 The One Man’s Dream exhibition is a celebration of Walt’s life and his dream of building a theme park where all the members of the family would have a great day out. There is an interesting movie at the exit which shows how the Disney idea went from Mickey Mouse to the Walt Disney World which you enjoy today. This is a very entertaining 3D show with mainly animated but some live action showcasing The Muppets. Even the pre show for this is worth a visit as you will be kept entertained by Kermit and the gang as you wait for the theater doors do open. 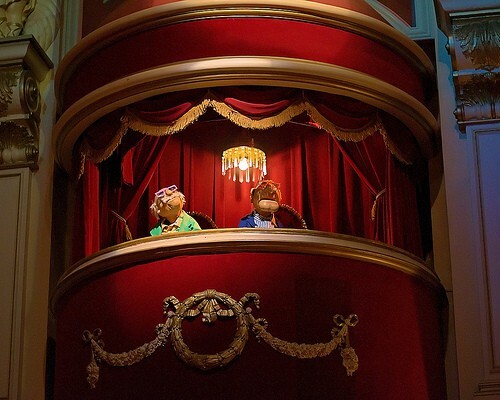 The theater is an exact copy of The Muppet Theater from the 1970s television show. You will even see Stadler and Waldorf in their box. The 3D movie does of course resort to “cheap 3D tricks” and the humor is very much what you would expect of the show, so it is a hit will all ages. Since the success of the new Muppet Movie a younger generation will also be familiar with the characters including Kermit, Miss Piggy, Fozzie, Gonzo and Sam the Eagle. The shows run continuously so usually there is not too much of a line. This one if a bit of a controversial one as some feel that this just isn’t Disney enough. 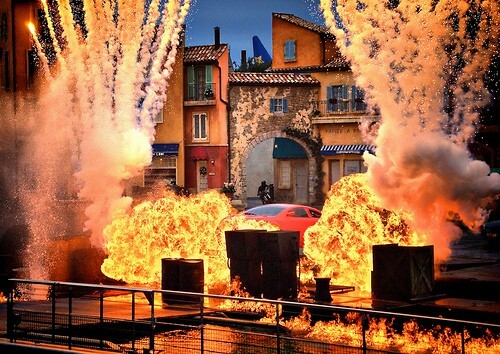 The stunt show idea was taken from the show which has run in Disneyland Paris for many years and is not really based around any particular Disney idea. True it used to have Herbie and now it has Lightning McQueen in a very short (and disappointing) sequence, but really this is a show about fast cars and scary stunts. The outside stadium is huge (it holds 5,000 people) and a little uncomfortable (solid metal benches), but the stunt show is worth the wait. The back drop is a French village, and the stunt show will take you through fast car chases, motorcycle stunts, explosions and fire. Disney took the idea for the show from Disneyland and made it better by giving it it’s very own 6,000 seat amphitheater. Fantasmic is shown on select nights only so check the Disney schedule before you visit. At busy times the show is shown twice nightly. To say Fantasmic! is spectacular is an understatement. The story line is Mickey Mouse fighting the path of good triumphs over evil. The stage is huge, the effects are amazing, and the musical score is brilliant. You will see many of your Disney character favorites including a sequence of the Disney villains projected onto water. This 25 minute show is Disney at it’s spectacular best. See Malificent transform into a 40 foot dragon, watch as Mickey Mouse battles the evil dragon, be amazed as the water surrounding the stage bursts into flames. And then be very glad that everything is resolved in a happy Disney way and you can see many of your favorite characters sail around the water which minutes earlier was all ablaze. Fantasmic! is very popular. Extremely popular. Even though the stadium seats 6,000 guests and can accommodate many more standing, it does fill up. If there are 2 performances the later one is usually the least busy. You must arrive at least 60 minutes and if possible up to 90 minutes early to get the best seats. 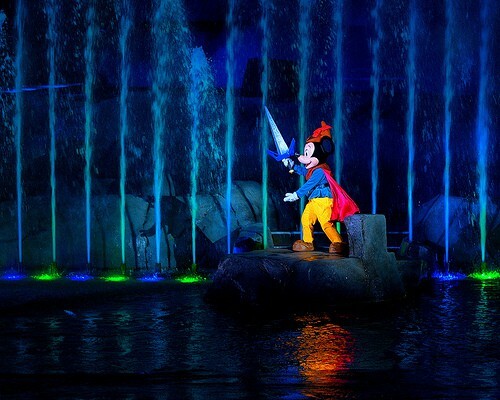 If this is not your idea of fun then consider booking a Fantasmic! meal package at one of the Disney Hollywood Studios restaurants. This will not get you a reserved seat, but it will get you a seat in a reserved area which means that you only have to arrive 30 minutes before the show starts. Book a Fantasmic! Dinner Package online or by calling 407 WDW DINE. 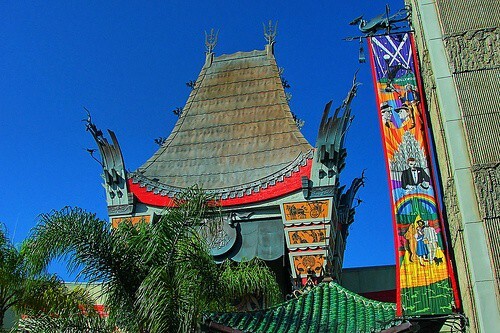 Which is your favorite Disney Hollywood Studios attraction? Leave me a Comment below to let me know your favorites.